January 25, 2010 Dan O. Now I can see where Kate Hudson gets her looks! Goldie Hawn shines as gentle librarian Gloria Mundy, who finds her peaceful and slightly boring existence shaken when she uncovers a plan to assassinate the Pope in this action-comedy inspired by Alfred Hitchcock thrillers. 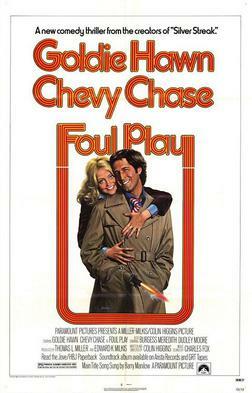 Fearing for her life, Gloria elicits the help of local cop, Tony Carlson (Chevy Chase), who’s game enough to take on the strange case. Good thing, too, as matters morph from odd to bizarre and love blooms between the two. This film is weird in a way cause it combines all these different elements of film. It features a mixture of comedy/thriller genre with a bit of Hitchcock. I think the film fails at a lot of the comedy its trying to hit here in the film. Some jokes do hit the money, and actually bring out a couple of laughs, but there are some that are just bad. By the end of the film there was way too much physical comedy to make me laugh, like honestly how many times can we see a guy getting hit in the balls? The film’s run time is quite long actually almost hitting the two-hour mark which I felt was not needed at all. I thought this blending did work out in some ways but in others it just failed. I think the thrilling aspect was actually too dark, and by adding this witty comedy kind of had a bad taste. Goldie Hawn does give off a good performance here and shows that she can be funny, cooky, and also very weird but make it seem believable. Chevy Chase I was surprised by cause he’s not very funny here. Yeah, you can see the charm that would help him out later on in his life, but it just doesn’t click here. My favorite supporting act is Dudley Moore from Arthur, he gives off that zany character we know him from and makes a lot of the moments that are serious, funny. Consensus: Foul Play has some funny moments and good performances, but fails with the genre blending of thriller and comedy, and runs on too long with way too much witless physical humor.